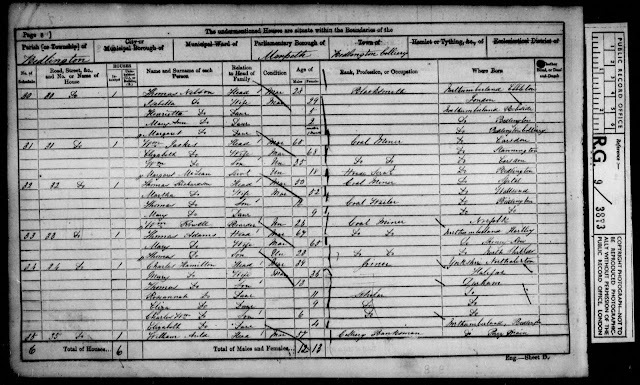 I've been following Martha (Reay) Doyle Richardson in U.K. Census records. In 1861 she and Thomas, along with three children and a boarder, were living in Bedlington Colliery, Bedlington Parish, Morpeth, Northumberland. They are family 32 on this census page. In the previous census, Davie was an 11-year-old coalminer. Davie is not recorded in this census with his family. He may have married, moved away to work in a different coal mine or different profession, or he may have died. In this census, Thomas, who was 1 in 1841, is now 12 and working as a coal miner. It's likely that Davie, Thomas, and Mary are all the children of Martha and Thomas and not Martha's stepchildren. It's possible that having the names of these children may help me find further information about Martha. I hope to find a civil death record or a parish burial record. I'm also on the trail of Martha and Thomas's marriage record. Young boys working as coal miners paints a sad picture. Oh my goodness, yes, Colleen. At a time when boys could have become apprentices or been in school, my coalmining ancestors sent their sons into the mines, either as breaker boys, door boys, tenders of horses, to do other work, or as actual miners. I often wish I could go back and make their lives easier.